At the two Native American schools Education World visited in northern Maine, cultural heritage used to be maintained by a diminishing number of tribal members fluent in their native languages and knowledgeable about their traditions. But the introduction of Native American studies to the schools' curricula has yielded an enthusiastic response from students. Tribal leaders hope that the resurgence of native studies in many reservation schools over the past 18 years will help the next generation recapture its now struggling culture. Included: Descriptions of Native American studies programs. On John Bear Mitchell's first day of junior high school -- off the Penobscot reservation where he lived and had attended grammar school -- a teacher scolded him for speaking in his native language. The boy nearly was expelled. That incident set the tone for a trying school year. Mitchell repeated seventh grade after failing every course, including physical education. "What bothered me was the racism," said Mitchell, 33, now the native studies teacher at Indian Island School, a Penobscot reservation school outside Old Town, Maine. "Almost every day when I was a student in Old Town [High School], I was called a spear-chucker and wagon burner. It affected me. "I took a proactive position, though," he continued. "Instead of putting my head down and believing what I was hearing, I lifted my head up and I got my education in education so I could help our kids understand a little bit of who they are. Then they can talk about who they are when they are put in these positions and these situations." Mitchell, who has a master's degree, plans to earn a doctorate in curriculum development. Mitchell and other native studies teachers at two Maine reservation schools Education World visited --Indian Island and Beatrice Rafferty School on the Pleasant Point Passamaquoddy reservation in Perry -- believe teaching students about their culture instills pride and leads to greater academic success. They have committed themselves to preserving and passing on their culture and languages, often motivated by their own experiences with prejudice. From the first moment a visitor walks into Indian Island and Beatrice Rafferty schools, there is no mistaking that the students, teachers, and community members value their Native American heritage and language. At Indian Island School a floor mosaic at the school's entrance depicts a Native American man in traditional headdress, and the following words: Penobscot Indian Nation, purity, faith, and valor. Nearly all of the school's hallway bulletin boards use the Penobscot language to identify the themes of student work. In the school's library, two carved wooden totem polls stand nearly 12 feet tall, the work of community members and the school staff. Large tapestries hang from the library's ceiling, along with many student-designed tapestries representing clans within the tribe. At Beatrice Rafferty School, the school day begins with announcements that include a student reciting the Passamaquoddy word of the day over the school's public address system. The Passamaquoddy alphabet is displayed on the walls in some of the classrooms. Native American symbols such as woven "dream catchers" and "God's eyes" adorn the wall in the main office. The tribal influence is more than native words and displays. The tribe's focus on the environment is evident in the school's food recycling program. During the lunch and breakfast periods, a tribal member teaches students to sort their garbage, with leftover food used as compost for the tribal garden. Though it might appear at first glance that native studies is more important than academics at these schools, it is not. Native studies is only one small part of the schools' curriculum. However, it is a significant part, tribal members and educators told Education World. The indirect benefit of teaching students about their culture and language is to help them be proud of their heritage and consequently boost their self-esteem, so they are better prepared when they transfer to a high school located off the reservation. There they will be in the minority for the first time. The significance of native studies is rooted in the decisions of tribal leaders, who have the final say on how their children will be educated. Tribal influence is everywhere at these schools and is especially evident in the daily role of the schools' native studies instructors. The instructors -- one at Indian Island and two at Beatrice Rafferty -- are not outsiders who happen to be knowledgeable about their tribes' culture and history. They are members of the tribe who live on the reservations. All the native studies teachers seem to share a sense of urgency regarding their role at their reservation's schools. The impact and success of their teaching can't be measured on a standardized test: their achievement will determine whether or not their culture and language is lost and forgotten. Most of the children do not speak their native language at home, nor do their parents. The native languages are being maintained by a diminishing number of tribal members who remain fluent. Tribal leaders have good reason to be concerned. Researchers estimate that most of the few remaining Native American languages are endangered. Of the 175 estimated indigenous languages that are still spoken in the United States, about 155 of them, or 89 percent, are near extinction, estimates James Crawford, author of Bilingual Education: History, Politics, Theory, and Practice (Bilingual Educational Services, 1999). "I have foreseen we're not going to have our language pretty soon," said Tuma Lewey, the middle school native studies at Beatrice Rafferty School and a member of the elected tribal council. "We want them to learn it so it won't be lost." Lewey hopes to improve the tribe's bilingual program, and has applied for a federal grant to add more native language instructors at the school. He also has helped to develop a Passamaquoddy dictionary. Preserving their language is an essential part in saving their culture, tribal members explain. "The language and values go together," said Chris Altvater, a member of the Passamaquoddy tribal community and the school counselor at Beatrice Rafferty. "Without either one of them it is not possible for the people to understand who they are or where they are going. Very few of us can read or write it. "Back then [1960s] everyone spoke Passamaquoddy," Altvater continued. "We were told not to speak it. It was English only. The situation has been reversed, but few speak it now. It is still dying out with all of these efforts. Only people 45 years and older are able to speak it, which is the result of 20 to 25 years of younger people not speaking or learning it. We are trying to revive it, which is pretty hard." The tribe faces other problems, such as keeping its students in high school. Nationwide, the high-school dropout rate for Native American students is far higher than the rates of other minority students. In fact, research has shown that many Native Americans perform poorly in traditional schools; dropout rates average 35 percent nationally. 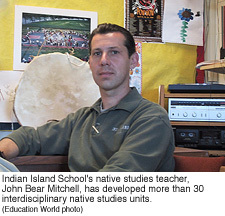 Indian Island School is one of the success stories, with a dropout rate for its graduates that has averaged about 25 percent over several years. The dropout rate for Beatrice Rafferty School alumni is about 60 percent. 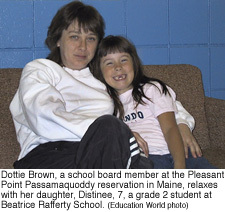 Dottie Browne, the mother of four children who attend Beatrice Rafferty School and a newly elected school board member on the Pleasant Point Passamaquoddy Reservation, knows first-hand about the struggles of succeeding at a public school after attending a reservation school. Though she was considered a top student on another nearby reservation when she was a pupil, she struggled after transferring to a public high school. Her goal as a school board member is to make sure today's students have an easier time than she did. "There were 10 kids in my class and only two of us graduated in 1980," Browne said, referring to her peers who transferred to a public high school. Tribal leaders also are confronting substance abuse among its members, a problem that works against reversing the dropout rate. "Drug and alcohol abuse have always been a problem," Browne said. Currently, the biggest challenge facing the reservation is to reduce young people's abuse of OxyContin, a prescription pain medication, she explained. In an effort to increase community members' awareness of the effects of drug and alcohol abuse, the reservation hosted a three-day workshop on substance abuse. The tribal government, school, and private donations funded the program. Regardless of the problems that face the tribe, Browne believes the best place for her children is on the reservation. "I want my children to know their culture, language, [and] heritage, so that's why I am raising them on the reservation," she said. "It would be difficult to teach them these things off the reservation." Teaching children about their culture starts with the reservations' youngest residents: both of the reservations' tribal day care and preschool programs include native language lessons and native storytelling. At Pleasant Point, the tribal leaders are working on a program that also will teach parents of young children their native language so it will be spoken in the home. "The [native] religion is only as good as the knowledge of the language," said John Bear Mitchell, the native studies teacher at Indian Island School. "Our language honors a lot of what exists or existed." It is easier to communicate tribal values and morals through our native language, Mitchell added. 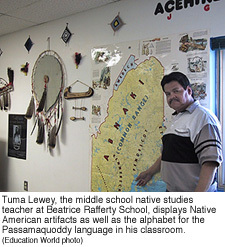 Tuma Lewey, the middle school instructor at Beatrice Rafferty, said he is motivated to help students and pass on native culture partly because of his personal experiences as a student during the mid-1970s. "I experienced a lot of prejudice," he said. "Natives were not allowed to sit in the front of the school bus. We were required to sit in the back of the bus." Lewey believes that if students have pride in their heritage, they are more likely to succeed. Mitchell agreed. "When we crossed the bridge [into Old Town] and people would ask you, 'Who are you?' I couldn't tell them who I was. It really made you feel like you are nothing because you didn't know who you were. What part of your culture were you knowledgeable about? I couldn't say that." Even though his family passed on a lot about the culture through storytelling, he still felt that he didn't understand his culture. "I think [native studies] is essential because a lot of times the kids ask, 'How did Indians do this or how did the Indians do that?' Well, you want to look at them and say we instead," he said. "We are taught through media far too often that Indian people are a thing of the past," Mitchell continued. "Even in Native American reservation schools, rarely will you find any curriculum that addresses the present or, needless to say, the future of native culture." Mitchell hopes his efforts will change that attitude with students at Indian Island and with others at other reservations as he shares his curriculum units that encompass the past, present, and future of Native Americans. The emphasis on Native American language and culture appears to be a hit with students at both reservation schools Education World visited in northern Maine. During the visit to Indian Island School, students participated in traditional drumming, singing, and dancing following a reading awards ceremony. Most students were eager to participate in the hour-long program. The same avid interest was apparent at Beatrice Rafferty School. 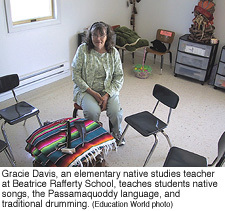 When Gracie Davis, the school's elementary native studies teacher, who is also a resident of the reservation, arrived to take the fourth graders to her classroom, they broke out of their end-of-the-day restlessness. They rose quickly and quietly and filed out as she spoke softly and only in Passamaquoddy. Davis greeted her students with smiles and hugs as she escorted them to her classroom, which perches on a slight hill and has an exquisite view of the Atlantic seacoast. The students took a seat around a traditional native drum, which was covered with a blanket, a feather, and a pipe. One child passed along a padded drumstick -- there was one for each student -- until each child had one. Ceremoniously, Davis removed and folded the blanket. The children were handed the blanket, feather, and pipe, which were passed around until the first child in the circle nearest a wooden container placed the items inside it. The children were extremely respectful of the ceremony, and also of their teacher, who they referred to by her first name, Gracie. The children enthusiastically drummed and sang in their native language. When the 45-minute class was over, the students thanked Davis, lined up, and left as quietly as they entered the room. Perhaps the students' behavior and keen attention to their native studies lesson is an indication of the tribe's success at capturing the next generation's interest in its heritage and language.